This one-of-a-kind resource for mental health professionals covers treatment issues unique to children and families who have a relationship with the fostercare system. With a focus on understanding how to navigate the complexities of the child welfare system, the book identifies and addresses mental healthand behavioral issues specific to this population and provides proven, effective treatment interventions. It brings together in one place the myriad ofcurrent resources available to help such children and families, and addresses situations that span removal from the home to kin or foster care, to reunification, adoption, or other permanent family connections. Broad in scope and depth, the text addresses treatment issues not discussed elsewhere, such as how to cope with acting out in the foster home, how to draft a behavior modification plan, and how to maneuver through the court process. It delivers evidence-based guidelines for engaging and collaborating with other professionals, addressing crises, and assisting with transitions. 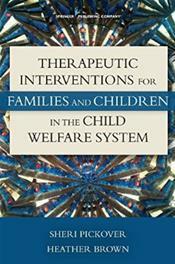 The book also discusses the use of medications and barriers to effective treatment. Strategies are directed at such specific issues as sexual abuse, physical abuse, substance abuse, neglect, trauma, and attachment. Of special interest is a focus on the worldview of the parties involved in the child welfare system, including the child, the family, the birth parent, and the foster parent. Chapters weave case studies, ethical issues, multicultural concerns, and current research into a highly accessible guide.